In Yoast SEO 3.2 we added a new feature called the help center. The help center is meant to help you figure out all the settings in Yoast SEO. To do that it contains a ton of training videos. In Yoast SEO 3.3, which we released this week, we added knowledge base search to this help center. In this post I want to show you how you can use these features. Where do you find the help center? Clicking it expands it to a large purple box. In this box you’ll find at the very least a video tutorial, knowledge base search and an email support button. We’ve created tutorial videos for every tab, so every tab has its own video. 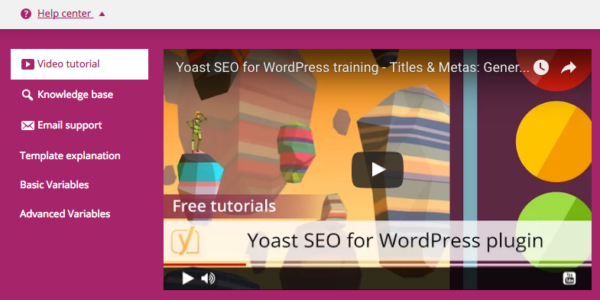 All the new features in Yoast SEO 3.3 already have tutorial videos. Click on it to hear me explain the features on that particular tab and how to use them. 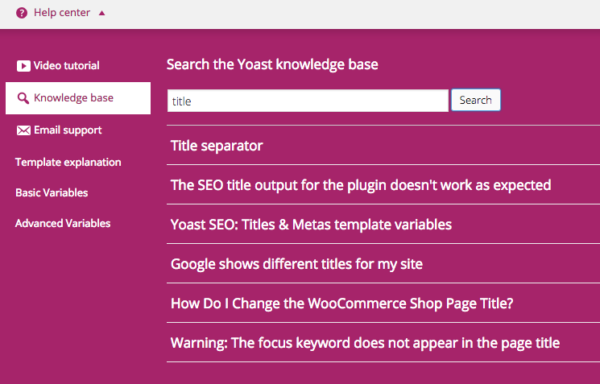 If you click on the knowledge base menu item, you can search through the Yoast knowledge base. Our knowledge base is a quickly expanding set of articles that explains common issues and answers common questions. With the new knowledge base search in the plugin, you have the knowledge base at the tip of your fingers. Because the help center has a fixed height, you can scroll past it and adjust settings while looking up the configuration help. 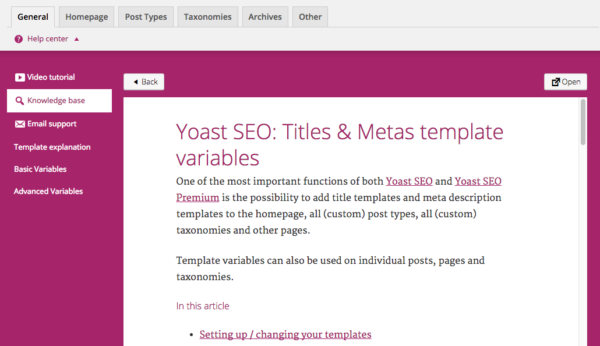 If you have Yoast SEO Premium, the third option allows you to easily message our support team. The added benefit is that in the message that gets sent to our support team, we add a lot of meta-data. Our support team gets some server variables, a list of the plugins you have installed, the themes you have installed and your license key. That way we can prevent going back and forth for basic questions like that.